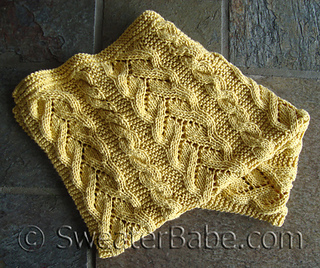 Gauge is approximately 17 stitches = 4 ¼“ 11 cm and 23 rows = 4” 10 cm in Curvy Vine Stitch on Size 9 5.5 mm needles. 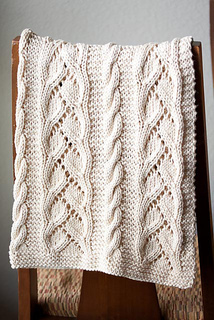 Here is a gorgeously textured blanket that combines wide pretty lace panels with bold, simple cables. It’s knit in a soft, pima cotton and modal yarn from Knit Picks in a sophisticated color that would compliment any baby or sofa! 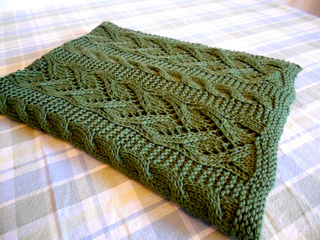 The yarn has a luxurious feel and makes the blanket incredibly soft and supple. Finished Knit Measurements: 23 ½ (29 ½, 35 ½, 47 ½)“ 59.5 (75, 90, 120.5) cm wide x 25 ¼ (39 ¼, 45 ¼, 59 ¼)” 64 (99.5, 115, 150.5) cm long. XS (S, M, L) to fit Stroller/Car Seat (Baby, Crib, Throw). Creme Brulee sample in Knit Picks Shine Worsted. Substitutes listed.